Nature's Science HEMP SEED OIL™ is a plant based formula that provides a natural source of omega 3, 6 and 9. Hemp provides protein and fiber and the seeds contain a rich blend of essential fatty acids. 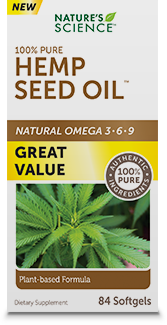 With a high nutritional value, hemp seed oil provides a 3:1 ratio of omega-6 to omega-3. In addition, hemp seed oil provides omega-9. This gives hemp oil a wide spectrum of omega fatty acids to support overall health. Nature’s Science HEMP SEED OIL contains pure, premium, natural hemp seed oil.